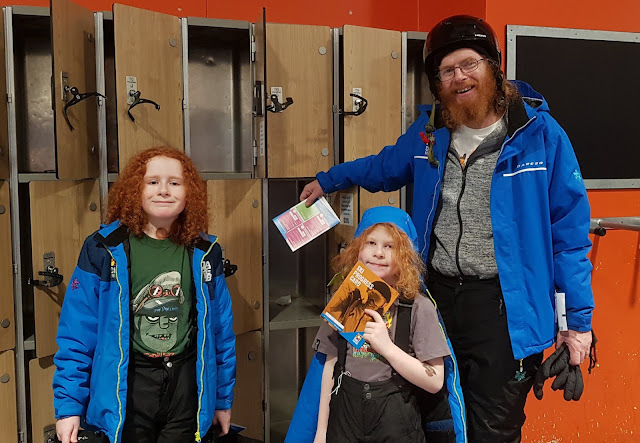 You need to wrap up as it's minus 3 or 4 degrees inside, but don't be fooled - skiing is exercise and as such you may find you don't need as many clothes as you might think. 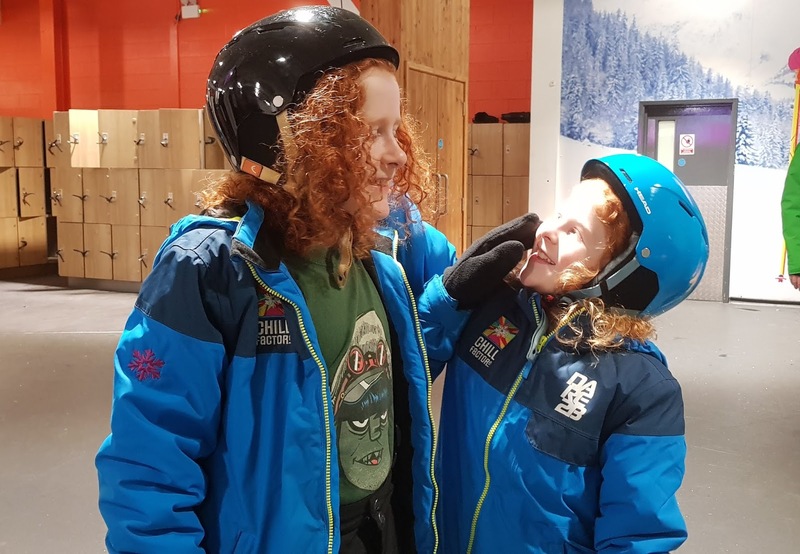 Helmet, boot and ski hire is included within your booking. We also hired the Chill Factorᵉ waterproof trousers and jacket (£8 per session) and the lads wore them with t-shirts and jeans underneath. Gloves MUST be worn and I recommend a lightweight hat plus thick, warm socks. If you are going to wear a helmet (mandatory for anyone under 18) then a thin hat will be more comfy. 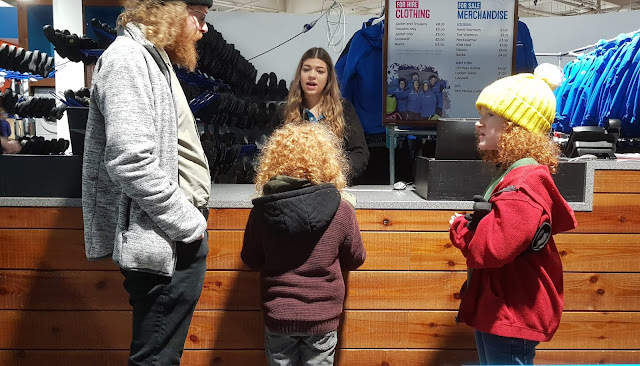 Arrive around 45-60 minutes before your session to allow time to park, collect tickets, collect clothing, measure your feet, collect boots and skis, and get dressed up. It genuinely did take 35-45 minutes although it never feels like more than about 10! There are loads of lockers, you'll need a £1 coin to operate them. At first my 3 were wobbling around and struggling to get anywhere just dressed in the boots and cold weather gear, but it didn't take long before they'd all mastered walking, and then they were out for their first hour on the snow. The first hour of learning to ski is by far the hardest. Side-stepping up the hill in skis you aren't used to is really exhausting and after 1 hour on the snow, a 1 hour break is very welcome and necessary. Take drinks because the atmosphere inside Chill Factorᵉ will dehydrate you, as will the exercise. There are loads of places around to eat or drink in the Beyond complex, including Nandos, Lift Up café, Wetherspoons and Pauls Ice Cream. After the break my intrepid adventurers had already improved their walking and sliding skills enough to use the travelator ramp and it was all downhill from then on - in a good way! The 2 hours after the break is when they started to really get the hang of snow plough legs and could begin to have a bit of fun coming down the slope. You start from further up the hill as you get better and by the time we went home on the first day, all 3 of them were competent enough that they were allowed to ski from the very top of the smaller hill. Something my 9 year old especially was ecstatic and very proud about. The three of them were all excited about returning on Day 2. We aren't a sporty family and I thought they'd suffer, but genuinely no-one had any bruises and they weren't stiff or sore. I know some of that is luck, but mostly it's a credit to the instructor. She pushed them, but not too much. On Day 2 we had a change of instructor and this gentleman was just as helpful and patient. As ever all of the Chill Factorᵉ staff were friendly, helpful and never let you feel an idiot, however daft your question. Throughout safety was their no.1 concern. 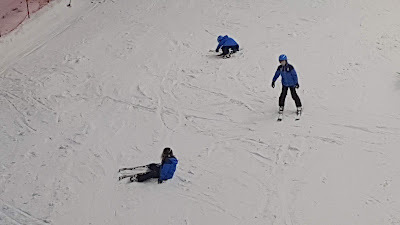 For the hour before and hour after the break, the boys honed their skills with obstacles and other exercises to improve control and balance, until for the final part of the session, they were allowed over to the big slope. Only half way up for now, but still a whole new level of skiing and the ski lift! Here's our video showing a snippet of each level of progression. My 3 are in blue with helmets and the boys were the shortest and youngest 2 in their group (groups have a maximum of 10 learners aged 6+). I can't comment on the full day course, but the 2 x 4 hour sessions with ski for an hour, 1 hour break and ski for 2 hours worked really well. The learners were utterly exhausted after the very first hour and really needed that break. 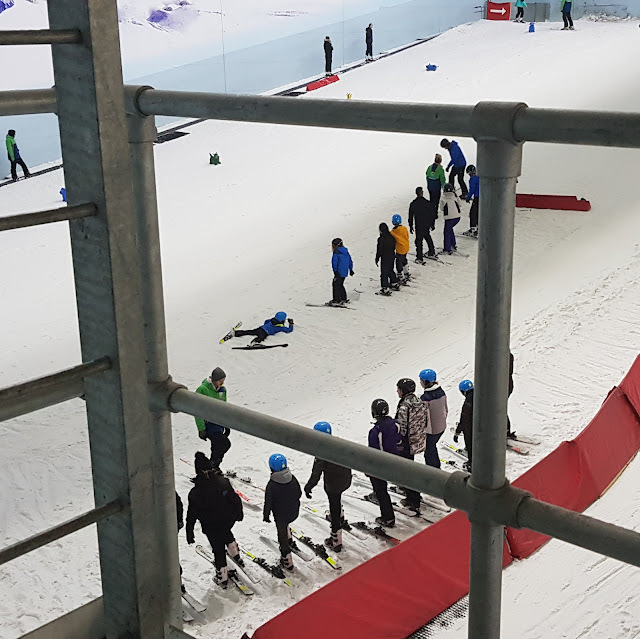 Moving on to the big slope for the final hour or so really made them feel rewarded for all of their hard work and let them really enjoy what they'd learnt. 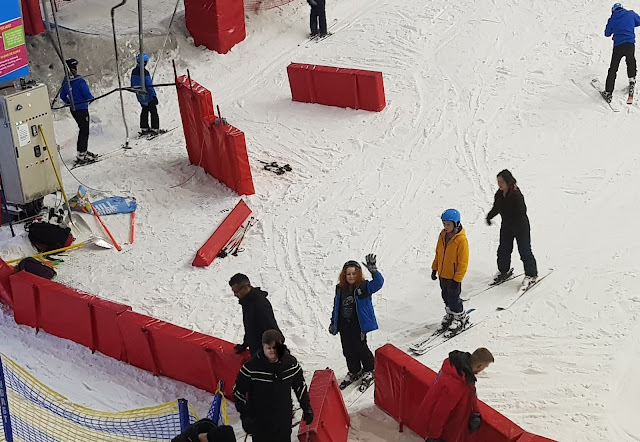 At the end of the session you are given a record of your achievement, which is not only a nice keepsake, it's also proof of which level of skiing you have achieved and allows you to return and go on the main slope - to the middle. A Lift Pass costs from £14-30 for an hour. 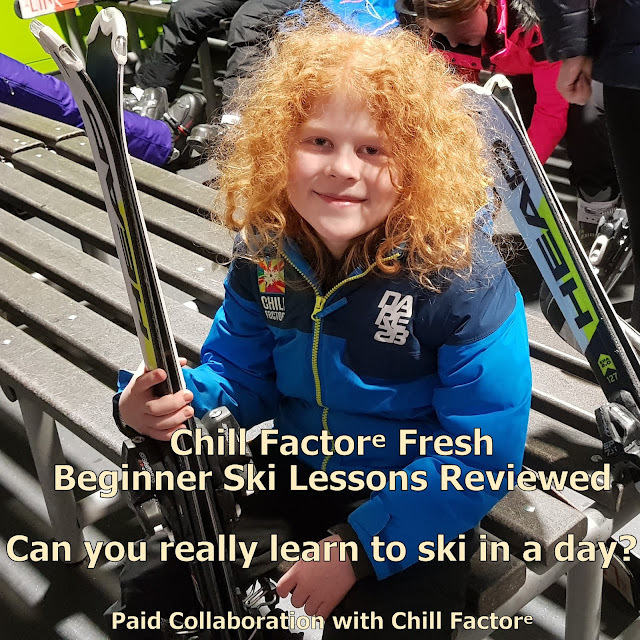 Lessons are available for skiers of all different levels and all ages, including Kids Snow School for younger children. Children aged 6+ can join in mixed lessons, anyone under age 10 must be accompanied by a paying adult. All the information you need plus latest offers can be found on the Chill Factorᵉ website or call 0161 749 2222 (10am-6pm weekdays / 10am-4pm weekends). Our Beginner Ski Lessons and Clothing Hire with Chill Factorᵉ were free of charge for review and we were paid a fee towards expenses and time spent creating the video and post. Obviously this in no way affected the ability of my family to ski, or the outcome of the review. This sounds ace! I’ve been meaning to visit for a good ten years but haven’t made it inside yet! It sounds like the kids had tons of fun and learnt a cool new skill to show off to their friends! 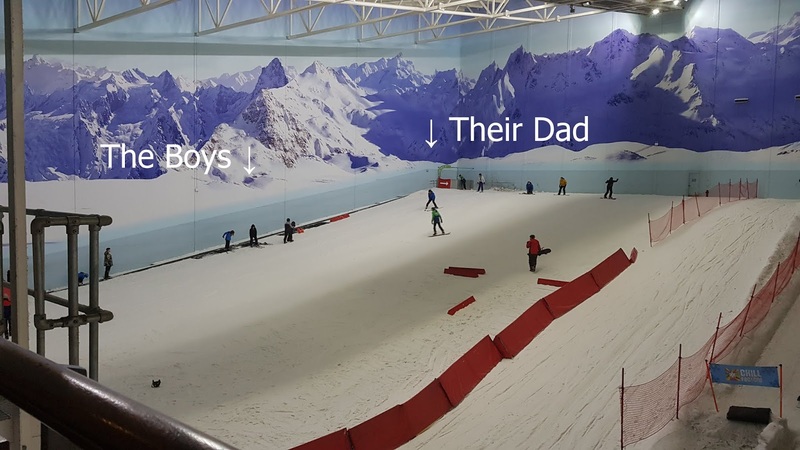 I went to Xscape recently to try out their trampolining park and all I could think about was wanting to try the slopes. I've never skiied before either it it's great to find out you can learn in a day or two. How brave! I've looked at the big slope and it's daunting. I imagine with a good instructor it's slightly less. Fair play to them for cracking on and congrats on the free WiFi. Always a winner. Where to next? Ski Apres? This looks like so much fun, totally something Ben would enjoy. Really good price too! This looks awesome. 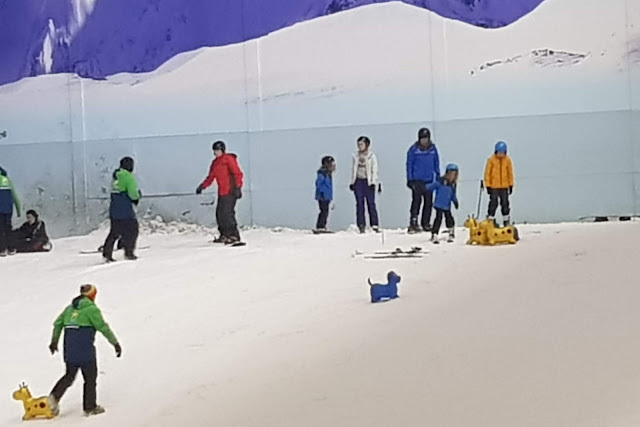 We went to Mini Moose Land before Christmas and I loved the look of the skiing when we were there! I must go! This looks like a lot of fun, and a great price. You got some cracking photos there too! This just looks so much fun! I really want to have a go with my lot!!! Such a great skill to have as well.